cubicles.com Blog – Rethinking Office Cubicles? Image of cubicles © Arjun Kartha. 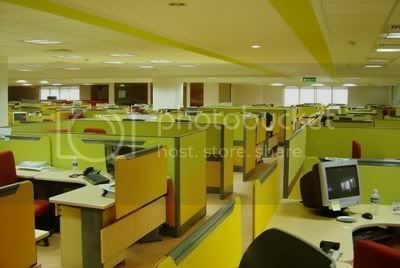 Office cubicles just work for many companies. They’re compact, efficient working spaces. They rationalize the use of office space. Finally, office cubicles offer an egalitarian solution that many highly-stratified companies turn to when communication breaks down between layers in the corporate hierarchy. But has the time come to reconsider cubicles? Consider this: layoffs are decimating the workforce – gaps in the cubicle village are starting to show. The space-saving cubicle is becoming obsolete in offices with office space to spare. At the same time, a growing chunk of the remaining workforce has a different view of cubicle hierarchy: the enclosed walls clash with a millennial generation that values face time. McKesson […] has been forced to accommodate three generations of workers with three different workplace expectations. Boomers still desire the entitlements of an individual working space; middle-aged workers (Gen X-ers) don’t require as much space, yet still value a personal station; and millennials, who are unattached to personal space, are comfortable working from home or cafes and tend to view offices and high-walled cubicles as dead zones. By tearing down walls that once separated the rank and file from executives and curtailed collegial interaction, the company expected operations to become more efficient. While it did work in terms of increasing collaboration among some groups, others found it distracting. “They received a lot of feedback from business units that said, ‘This really isn’t supporting our work habits really well,’” said Smead, who was involved in the redesign. There’s still room for the cubicle in the workspace; there will always be offices where hierarchy and efficiency are important. But the push and pull between the open-spacers and the cubiclists will probably go on for some time; winner TBA. I think it’s very true that Gen Y and even Gen Z are coming to appreciate that open plan actually does prove more effective business-wise.